Today I met my friend Nancy, a Coronado resident, for lunch (I recommend the Gorgonzola Tartine) and a tour of her library (I recommend everything). This library was originally a small building (see above photo) but has been expanded out several times. The last one incorporated two 1938 Alfredo Ramos Martinez fresco murals. 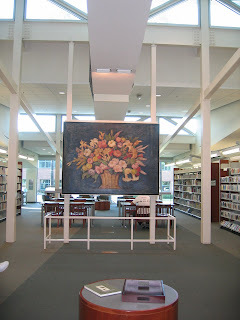 Originally, they were painted on the walls of Orange Avenue restaurant La Avenida Cafe, and transferred to the library in the early part of this century. "El Dia del Mercado" incorporated several cafe doorways, and the Coronado library's front desk was designed around these same spacing parameters. (Check out photo below). While browsing the stacks, Nancy and I came upon a series of signs with arrows and the word "Playaways." Like good sheep we followed the arrows, and arrived at a shelf of single-unit audio book players. Which are pretty darn cool, because you'd never again check out a CD only to find it scratched. The San Diego libraries don't have Playaways. Coronado's one up on us. This library is so geared to its small community that it doesn't just take suggestions, it has a suggestion notebook. Patrons write out their opinions and staff then type them up along with a response, and print out and incorporated them into a notebook. My favorite suggestion came from a patron who asked that markers be put back on the rose brushes out front, because "there is one rose bush that I just love, but can't identify". The library staff responded that this idea had been discussed in the past, but has not yet been enacted. I love small towns! Nancy asked that I mention the "library neck" that seems to afflict a good deal of patrons in libraries the world over. Its symptoms include squinting eyes, a slumped chair position, and a pronounced tilt to one's neck as they devour their tome. I'm not sure what's to be done about it--computer use results in a similar affliction of "telescope neck"--but I'm sure there are worse problems to have. This Nancy person sounds facinating! She is. Ask her to do her impression of a European immigrant yoga instructor sometime. Can you clarify if that is "eastern" or "western" European? I have driver neck--same posture, but less literary. Sigh. what a beautiful library! such a joy to see. Makes me want to take a road trip. All this neck talk reminds me of Nora Ephron's essay (and book), "I Feel Bad About My Neck."